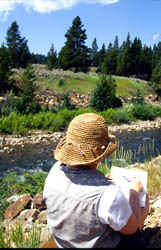 Rocky Mountain College, in Billings, offers a degree in art to enrolled students. Why is art included in the agriculture careers section? Artists help agriculturists sell their products to the public. An artist can design a company logo, a product package, or advertisements to relay a certain message about the product. Would you buy cookies if they didn’t look good on the package? Of course you wouldn’t and that is why artists are valuable to the agriculture industry. If you just like to doodle or are a serious artist, you may be interested in taking some of the classes offered at Rocky. There are so many art classes to choose from that it might be hard to decide which to take first. 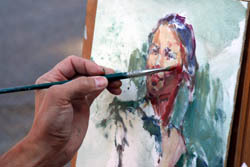 Some of these classes include drawing, painting, sculpture, architecture, photography, and the history of art. To find more information on this topic, go to the RMC home page at http://www.rocky.edu/. An artist could work for an agricultural company as their sole graphic designer or they could work for a consulting company helping many different types of customers. There is also the option of being independently employed. In any career, there are these types of decisions to make. Do you think it might be fun to draw pictures, take photos, or paint as a job? Did you ever imagine that an artist could be involved in helping agriculture? Are you starting to wonder what other careers might be related to agriculture? Check out some of the other careers described in this section of the montanakids.com website.